Photos on this page are all by Steve Rust. Many collectors have fine micro examples of linarite in their collections, from a number of UK and world locations. It is easy to understand why. Who would not like to have in their collection a fine azure blue bladed radial micro-crystal group of linarite, contrasted against a background of white quartz. The known history of linarite has been traced back to at least the early 19th century. 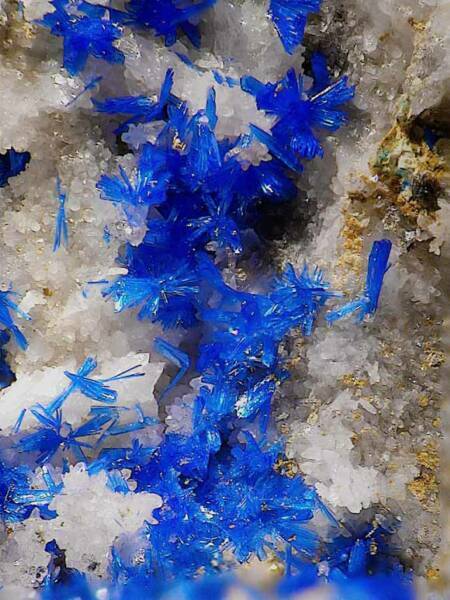 It would appear that James Sowerby was the first to publish a picture of linarite in his book of 1809, although he called it 'Crystallized Blue Carbonate of Copper'. It would appear that the sulphate content of linarite was not recognized. 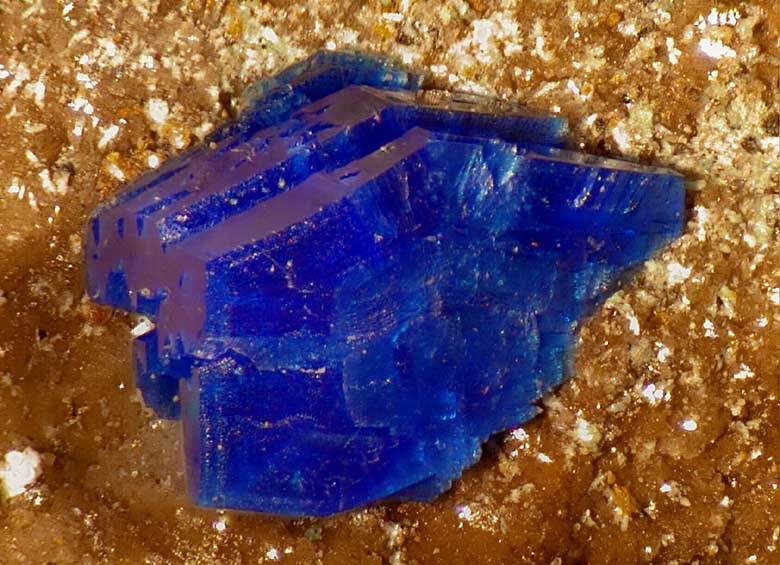 It was not until 1839 that the species was given the name linarite by Professor Ernst Friedrich Glocker, from it's type location at Linares, Jaen province, Andalusia, Spain. Linarite PbCu2+ (SO4)(OH)2 is usually found as thin bladed monoclinic crystals with little development of the prism faces; thick chunky crystals are also to be found. Colour is from light to deep azure blue. It usually occurs in lead and copper deposits, while this is true it is a very general statement. Linarite can also be found in many other ore deposits, which might have only small amounts of primary lead and copper minerals, from which linarite can form. In the United Kingdom some of the best macro examples of linarite have come from Redgill Mine and Roughton Gill Mine. Classic specimens of thick bladed crystals of linarite to 2.5cms long were collected from the previous locations in the 19th century. Fine examples are in the NHM London collection, and a few museums around the world. Comparable specimens to those from the Caldbeck Fells were also collected in the same period from the Leadhill-Wanlockhead mining district, where linarite was found in crystals to 1cm. From this classic mining area good micro-specimens can still be found. 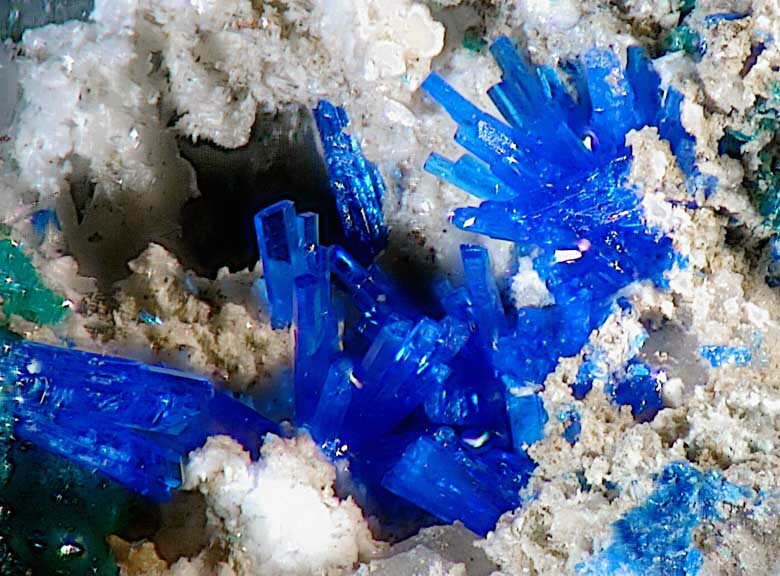 Excellent specimens of linarite are also note-worthy from the Meadowfoot Smelter slag's where fine deep azure micro crystals to 2mm were found, with a number of other Cu, Pb supergene minerals. Wales! Well what can be said about linarite from particularly mid-Wales. It almost seemed in the early years of the BMS; if you went to any mine dump it was going to produce linarite specimens. This was not true, and usually entailed a lot of investigation before hand. Only the most noted locations are represented here. Certainly the most prolific site for fine micro crystals of linarite has been the Eaglebrook Mine. In the early years of micromount collecting it was relatively easy from here. Producing not only fine linarite, but a number of supergene copper, lead, zinc and manganese crystals. 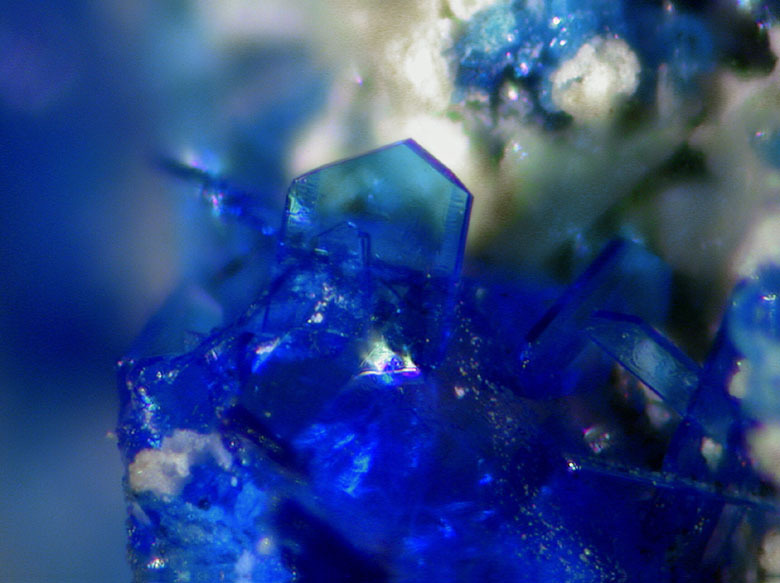 Linarite from this location has been found as excellent micro crystals to 2mm+. About 2kms to the north is Esgair Hir Mine. At this location, linarite is far rarer. Specimens are of comparable quality to those from Eaglebrook. Excellent linarite specimens have been found as carpets of divergent micro crystals covering areas to 1.5cms+. At the Geufron Mine occasional fine linarite micros are found as single scattered bladed crystals to 1mm with anglesite and cerussite in quartz cavities. Also occasionally as flat radial groups of crystals to 4-5mm diameter on partings in the mudstone. Dylife Mine. 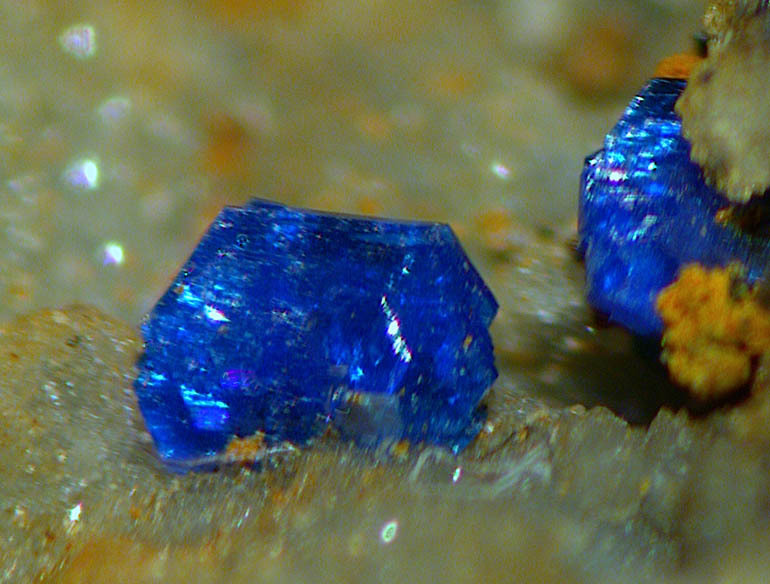 Here many of the linarite crystals are broad almost tabular to 1.5mm. Forming single crystals or small groups. The more usual bladed habit is also found here. Frongoch Mine is a location where I have done a lot of work. I still go back once in a while. 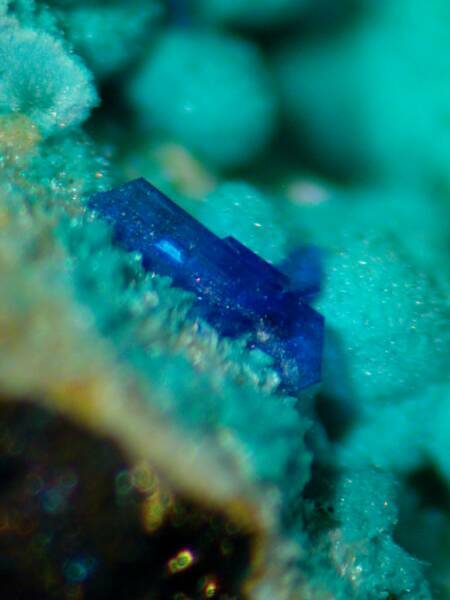 Linarite is comparatively uncommon in the supergene pangenesis, probably rarer than susannite. Even so it does produce some rather nice crystal examples, as broad to elongated bladed forms to 1mm. At Cwmystwyth Mine very good micro linarite crystal sprays to 2mm have been found. Penrhiw Mine has produced some fair examples of radial linarite crystals to 4mm diameter, with ramsbeckite and schulenbergite, in a partly oxidized ankerite-quartz-mudstone veinstone. At Nantymelen Mine the dumps have been much depleted; but what is left still comes up with the odd rare specimen of linarite. The mine has an honour of producing some of the largest crystals from Wales, occasionally up to 4mm. 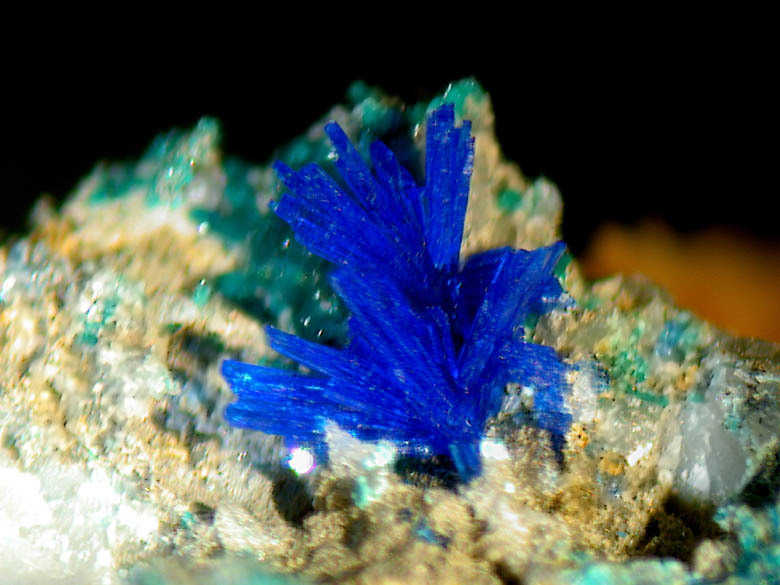 In North Wales linarite has been found at Llangynog Mine. Fine deep azure blue bladed micro crystals of linarite are sometimes found lining or scattered in cavities. 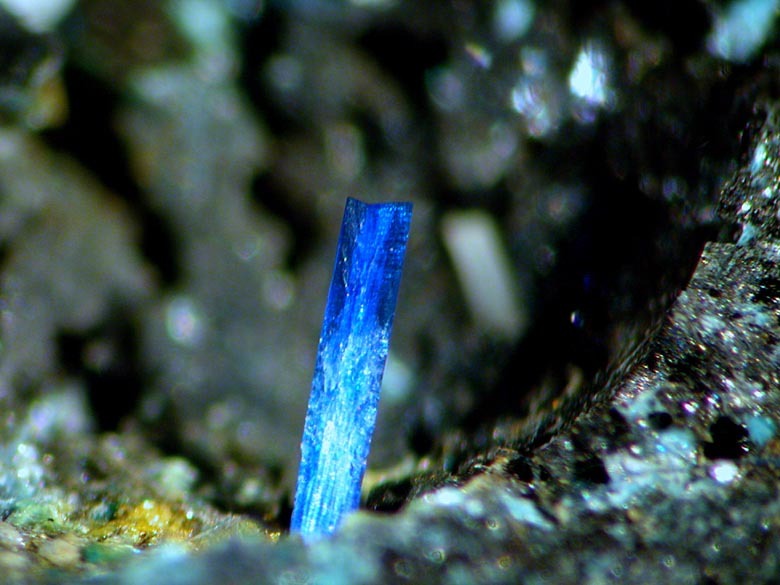 Waterbank Mine, Ecton, Staffordshire, has produced fine linarite in single crystals and rare radial groups to 1mm. 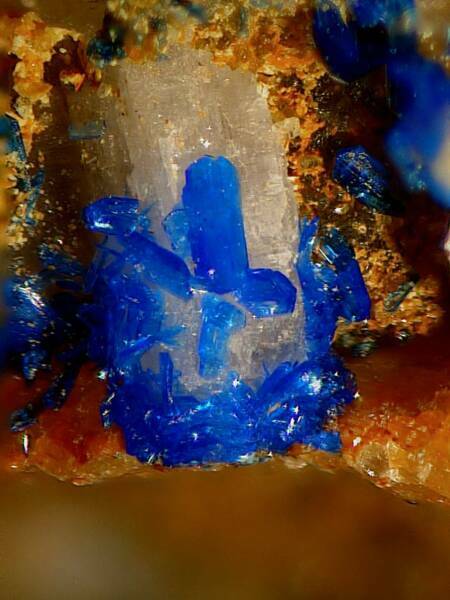 Linarite from Penberthy Croft Mine in Cornwall is rare. When it has been found, it is commonly in thin to thick bladed crystals to 2mm covering areas up to rarely 2cms. 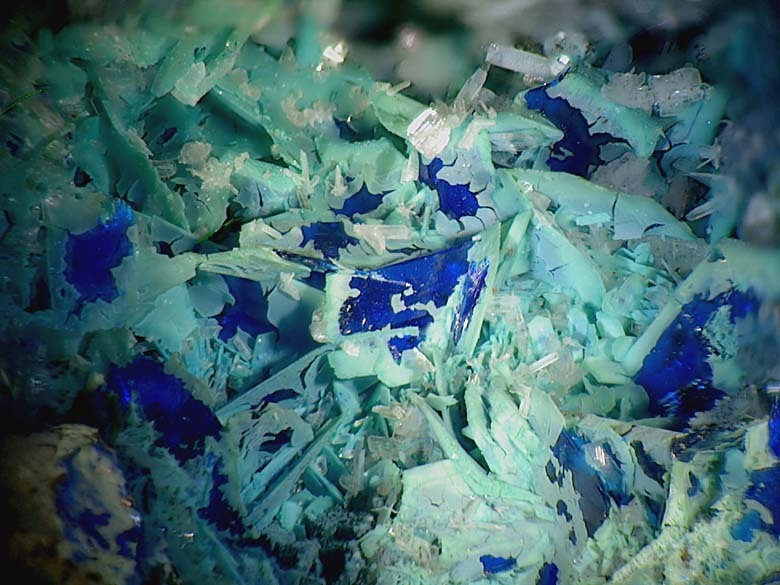 Some crystals have a particularly fine deep azure blue colour. There are many other locations in the UK for linarite, this has been just a personal snapshot.